AIKEN, S.C. (April 29, 2015) – More than 1,300 hunters are expected to participate in the annual SRS Deer Hunt Program at the Department of Energy’s (DOE) Savannah River Site (SRS). The program is managed by the SRS management and operations contractor Savannah River Nuclear Solutions (SRNS). For the general public, hunts will be conducted on Saturdays, starting in November and lasting through December. The hunter selection process is based on a lottery system. The mission of the SRS deer control activities is to conduct a harvest intended to lower the incidence of animal-vehicle collisions on the site and reduce feral hog damage to valuable plant communities, timber plantations and ecological research sites. According to SRNS deer hunt manager Joe Solesby, safety and security are always a top priorities at SRS. 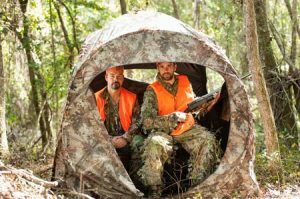 Auditors are placed throughout the hunting area to ensure the safety of the participants and support staff. Since 1965, SRS has provided optimal deer hunt opportunities for thousands of sportsmen. The site has over 150,000 acres of land on which the annual deer hunts are conducted. Harvesting deer has proven to be the safest and most effective manner to control the SRS deer population. SRS also conducts a Mobility Impaired and Wounded Warriors Hunt each year. It will be held on Friday, Oct. 16.